Trauma Towers at Blackpool, England. Photo courtesy Wikimedia Commons. Looking for a haunted house this Halloween season? The online guide Hauntworld will help you find the best one. Hosted by Hauntworld Magazine, a trade journal for those running haunted houses, it lists creepy attractions in every state in the U.S. and many in Canada too. Most listings just have promotional material from the businesses themselves, while some have garnered numerous reviews and comments, making it as sort of TripAdvisor for scary attractions. If you want to get scared on vacation, the international section will help you out. If haunted houses aren’t your thing, the site also lists hay rides, corn mazes, pumpkin patches, ghost tours, and zombie events. There’s even a section for supposedly real haunted houses. 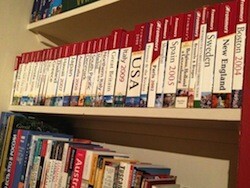 It was with a heavy heart that I read the news last week that Frommer’s guidebooks will cease to be printed. The guidebooks were purchased by Google last summer, and as of this year, the entire future list of titles will not be released. With the takeover of digital apps, social media, and user-generated content, we knew this was coming, but it still feels like the end of an era. It’s become fashionable for any traveler (especially for writers, including our own bloggers) to be dismissive of the printed guidebook, claiming they get all their tips “from locals on the road” or via social networks, possibly demurring to an occasional read of Lonely Planet. Let’s dispense with the tired traveler vs. tourist argument; we can all benefit from practical info for navigating a new place, and no matter how “local” you go, there’s nothing wrong with visiting the museums and attractions for which a destination is known. Even as an active member of the “new media,” I mourn the death of guidebooks like that of a friend. The greatest gift of the digital age to the traveler is online trip planning. I’d never want to go back to the days of travel agents and phone reservations. I’ve spent hours on the Internet booking flights, reading hotel reviews and soliciting advice and recommendations from friends, but guidebooks have always been the heart of my pre-travel ritual. Each year, after we had narrowed down the destinations to a few (often places where American Airlines and Marriott coincided, back in the days where work travel generated a fair amount of status, miles and points for free vacations), my husband and I would spend a few hours at a bookstore, poring over the guidebooks for points of interest, relative costs of travel and local events that might happen during our travel dates. Back when I worked at Conde Nast Traveler magazine, my desk was next to the research department, making me feel like a kid in a candy store. Shelf after shelf of guidebooks, atlases and travelogues gave me a keen eye for what features are the most useful in a printed travel companion.In addition to having the most current information, I look for an efficient presentation (while I love travel photography, I don’t care for it in my guidebooks, taking up valuable real estate and showing me things I hope to see myself) with detailed maps, a short phrasebook and menu guide, as well as a point of view in a guidebook. I had always made fun of Rick Steves and his fanny-packed followers, but in Portugal, I discovered his “back door style” is really quite helpful for navigating crowded tourist attractions and distilling fun facts about a museum’s history (look elsewhere for nightlife advice, though). My respect for Mr. Steves solidified with his book “Travel As A Political Act,” particularly due to his advocacy for travel to Muslim countries and the importance of getting a passport. Time Out city guides offer a surprising depth of cultural sidebars in addition to nightlife listings. Occasionally, you might be lucky to stumble upon an indie series like the gorgeously-designed Love Guides to India or Herb Lester‘s guides to the “usual and unusual” in Europe and the U.S., but these were often only discovered once you reached your destination. Lonely Planet was usually a given, having the widest range of places and most annual updates, but my heart belonged to Arthur Frommer. Frommer’s guides were never the hippest or most inventive, but I liked their no-nonsense and concise layout, stable of local writers and the personality that shown through the pages with “Overrated” tags and honest advice. I loved the history behind the Frommer’s brand, imagining how Arthur’s original “Europe on $5 a Day” changed the way Americans travel and opened up a world of travel daydreaming and practical trip planning. Writer Doug Mack recently published his own book, “Europe on 5 Wrong Turns a Day” using Frommer’s 1963 book as his only guide. Vintage guidebooks are priceless slices of the past, whether it’s a reissued Victorian guide, or a handbook for your trip to the USSR (the later is now one of my prized possessions). In 50 years, what will people learn about how we traveled to Asia from Facebook photo albums and TripAdvisor reviews? Destination and books chosen, I relished my New York commute armed with guidebooks before the trip. While I hated to ever brandish a guidebook while traveling, I didn’t mind being seen with it on the subway, where people might see me and think, “There’s a girl who’s going places! Literally, to Chile!” I imagined a stranger might strike up a conversation, offering their tips for their aunt’s restaurant in Santiago or their best friend’s guesthouse in Valparaiso (I was evidently envisioning a live version of Twitter). Even now that I do float travel questions over social media, I first try to research via a custom Google search that limits results to my trusted sources, ranging from travel writer friends’ blogs to big media like New York Times’ travel section and, of course, Frommers.com. During a trip, I’d carry a book in my purse during the day, but I only removed it for surreptitious glimpses of a map if seriously lost. While in a museum, I might allow myself the luxury of reading the book in full public view. In the evenings, I might peruse the book before dinner, not for restaurant recommendations, but for hints on what neighborhoods and streets might yield the most options. My husband has always loathed making reservations, even in our own city, preferring to rely on instinct, menu/curb appeal and highest density of locals. At the end of the night, I liked going back to read more about the places we’d seen, learning about the backstories of a city, and understanding the cultural importance of the names we saw on statues. Once I moved abroad to Istanbul in 2010 and constantly clutched a smartphone, my guidebook usage slowed, but I never fully gave it up. English books were expensive and travel plans were made much more freely (weekend in Budapest on Friday? Why not, when it’s a two-hour flight? ), but I still tried to cobble together some basic info before going to a new country – stuff like: how much to tip, the best way to get to the airport and the going cost of a bottle of local wine. Basically, stuff that could be found in a guidebook. In many eastern European countries, I found the excellent (and free) In Your Pocket guides, produced by expats and natives, with tips on everything from happy hours to hidden Soviet murals. The guides are available in various digital forms, but I always preferred to find a paper copy, easy to roll up in a purse and read cover-to-cover like a magazine. I experimented with various Kindle books and documents and apps to collect the many links and tips I found before a trip, but found a lot of limitations: poor maps, advice from inexperienced travelers, lack of context and real “meaty” content. Especially when I was stuck with a lack of Wi-Fi, a dead battery or a setting where it would be unwise to flash any form of technology, I’d yearn for an old-fashioned book. After I return home, I can’t say exactly what happens to my guidebooks. I don’t revisit places often, so I tend to pass on books to other travelers, leave them in airplane seat pockets, or recycle them when I have to purge books. I always liked the idea of keeping them on my bookshelf, a visual reminder of where we’d been, like passport stamps in your living room, but my shelf space can’t keep up with my wanderlust. Many travelers like a printed book so they can make notes and annotations in the margins, but I consider a book a sacred space to be left pristine, though my books are accessorized with receipts, ticket stubs and bar napkins. I keep these artifacts in duty-free bags and hotel envelopes, possibly for a scrapbook I will never make, or for future generations to marvel at the fact that we once paid for hotel Wi-Fi. Now that we’ve reached the end of an era, what’s to come in the next? Now that anyone with an Internet connection can tap into a local network, or crowdsource restaurant recommendations, is Mr. Frommer and his ilk destined to become a relic of travel, like steamer trunks and airplane ashtrays? I’d say that until apps and social media can overcome the limitations of user-generated content, there’s a niche for printed guidebooks, but the choice of print over digital is more visceral. We need guidebooks as long as there are people who love browsing in bookstores, who appreciate a beautiful map, and who don’t give a damn about being a traveler or a tourist, as long as they are going somewhere.